When you become addicted to the drug that is football you need to find ways to fill the cravings. Most fans hooked to the beautiful game follow more than the one team, for me it’s Cardiff City, Liverpool and AFC Bournemouth but this also extends internationally. Whether you're Barca or Real, Milan or Inter and PSG or Lyon etc each club has a distinct crest and this is the first in my new series on, “The Crest Dissected” looking weekly into the reasons behind why certain things appear on the badges fans hold so dear and the history of some clubs. We’ll begin with FC Barcelona, arguably the best team in the world and their famous crest. Barcelona were formed in 1899, by a group of Swiss, Spanish and English footballers. Hans (or Joan) Gamper was the Swiss man that became the first President of the club, he moved to Barcelona in 1898 and placed an advert in Los Deportes asking for people who were interested in a kick about to come forward. This led to the founding of the great Catalan club. This explains the reasoning behind the flags on the crest, the English flags for the English players, the Spanish stripes for the Spanish players and the historic red and blue kit for Gamper’s beloved FC Basel of who he was an early founder and captain. This is the same colours they play in to this very day as we well know. The crown with a bat on top, surrounded by two branches, one of a laurel tree and the other a palm were a link from the beginning to the City in which it was born. Barca hit some financial trouble around 1908 but Gamper stepped in and became their first official President. In 1909 the club moved to a new stadium, Camp de la Indstria and to celebrate they held a competition for someone to design a new badge. The winner was a player, Carlos Comamala, who was also a fine artist as well the club’s top striker. He scored a total of 172 goals in 145 games for the club and designed the shield that is still very much similar to the current crest. The team saw rapid expansion and another new stadium, Les Cortes, followed in 1922 which was eventually increased to 60,000 capacity with the official language changing from Castilian to Catalan. Gamper then recruited Jack Greenwell as the first full-time manager in Barcelona's history. After he was hired, the club's fortunes began to improve on the field. During the Gamper-led era, Barcelona won eleven Campeonato de Cataluna, six Copa del Rey and four Pyrenees Cups, enjoying it’s first "golden age" with stars like Paulinho Alcantara. The Spanish civil war began in 1936 and the Barca players fought alongside the Athletic Bilbaoteam. Dictator Franco assumed control and banned all signs of regional nationalism including Catalan. This mean the Catalan flag was banned and the club were prohibited from using non-Spanish names. 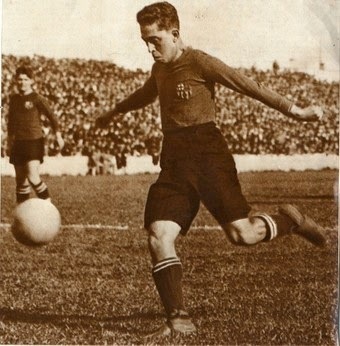 The measures forced a name change to Club de Futbol Barcelona see on the change of crest from 1938. They were even threatened by the dictatorship and after a visit to the changing room before one semi final against Real Madrid they were comfortably beaten 11–1. However they did go on to win more titles, even if their progress was stifled. 1957 saw the opening of the Camp Nou and in the 1960s Real Madrid dominated La Liga but it also saw the famous “MES QUE UN CLUB” (More than a club) motto developed. This has a variety of meanings with the FCB website stating “The Franco regime explains much of the extension of 'més que un club' to the rest of the Spanish territory” as a place for Catalans to unite along with their standing up on democratic and social issues. In the 1973/74 season Johan Cruyff signed from Ajax and won over fans when he told the press that he chose Barcelona over Real Madrid because he could not play for a club associated with Franco. When Franco fell in and died in 1975 Barcelona were again free to revert to their 1910 FCB dropping the CFB as Catalan became acceptable once more. Cant del Barca was adopted as the clubs anthem as the next 20 years saw stabilization and stars such as Lineker,Stoichkov and Guardiola graced the 99,000+ capacity Camp Nou as part of the “Dream team”. Nowadays we have all come to know and love the smart crest and same yet well varied red and white stripes of the kit. The most recent badge was unveiled in 2002 and has seen the club’s best years under the guidance of Rijkaard and Guardiola, even being the first ever team to win the sextuple in 2009. Throughout it all, Barcelona have never forgotten their roots and turbulent times, they see themselves as mes que un club and I fully believe they are right to!